Americans sacrificed sons and daughters and spent billions of dollars to destroy the Taliban and rebuild Afghanistan. As the U.S. winds down its mission there, it's becoming clear a lot of nation-building went off the rails. The Special Inspector General for Afghanistan Reconstruction (SIGAR) has been ticking off the projects that it claims are expensive failures, warning that some troubled projects continue to move forward. In the past three months, nearly $2 billion in questionable spending has been uncovered by SIGAR audits. The most recent is a report alleging that the Army Corps of Engineers paid contractors for building a teaching facility in Sheberghan, even though it was never completed and poses "serious health and safety hazards." The Iraq-based contractors were paid nearly $3 million to build three teaching facilities, but workers "abandoned" the Sheberghan project two years ago. They left a building deemed unsafe, with an electrical system that "exposes occupants to potential electrocution and fire hazards." What's more, SIGAR alleges the contractors used U.S. money to buy unauthorized window glass from Iran. Even though U.S. officials have said no one should use the facility, "Afghans are using it," SIGAR said. Those same Afghans want the U.S. to keep paying $50,000 a month to fuel an electric generator. Then there's the report two weeks ago announcing that a $34 million command headquarters built for the U.S. military in Helmand Province "will not be occupied." Military commanders decided three years ago that the 64,000-square-foot building wasn't needed, SIGAR says, "yet the military still moved ahead with the construction project and continued to purchase equipment and make various improvements to the building in early 2013." John Sopko, the Special Inspector General, toured the building and said, "It appears to be the best-constructed building I have seen in my travels to Afghanistan." However, he says, it now faces two choices: demolition or being turned over to Afghan forces, an option Sopko estimates would cost an additional $1 million to $2 million in installation of communication equipment the Afghans would need. The largest audit so far involves allegations the Afghan government levied nearly $1 billion in inappropriate business taxes on contractors used in American rebuilding efforts. Those costs were passed along to the U.S. government and, ultimately, U.S. taxpayers. SIGAR said contractors should have been exempt from those taxes under agreements between the U.S. and Afghan governments. Perhaps most disturbing, SIGAR reports the Department of Defense is proceeding with a $772 million purchase of aircraft it says "the Afghans cannot operate and maintain." 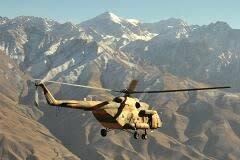 They are intended to supply the year-old Afghan Special Mission Wing with planes to support Afghan special forces on counterterrorism missions. Most of that money-$553 million-has been awarded to Rosoboronexport, a Russian company that also sells weapons to Syria. The Pentagon believes the Rosoboronexport Mi-17 helicopters are best-suited for the mission's needs. "They've been using (the Mi-17s) for years," Defense Secretary Chuck Hagel told Congress in April, according to the Washington Post. "Easy maintenance, unsophisticated." However, the SIGAR audit claims that ease and sophistication aren't the only issues. The new wing is only 25 percent staffed, and recruiting is slow because too many applicants fail the vetting process-"a process that attempts to eliminate candidates that have associations with criminal or insurgent activity." Only seven of the 47 pilots have so far qualified to fly with night-vision goggles. Sopko's office has made recommendations on how to stop the spending and suggested lessons to be learned from Afghanistan. In the meantime, expect the audits to ramp up as the U.S. military presence throttles back. As military officials in Helmand told Sopko, "Once a project is started, it is very difficult to stop."